Our Lady of Victory Parish is a part of the Roman Catholic Church. By the sacraments of Baptism, Confirmation, and the Eucharist, members of the Church are promised eternal life and are equipped to serve God and their neighbor, according to the gifts and talents which each of them have received. In this way, we worship God in Spirit and Truth and welcome his Kingdom into our hearts and into the world. In the early 1830's, the Roman Catholics of Delhi had to make a day's trip to attend Mass at Holy Trinity downtown. At that time, Delhi stretched from Seton Ave. in Price Hill all the way west through Sayler Park. This was quite a hardship for the mostly farmers of the township. On February 2, 1834, a small, determined group met at the house of Philip Owens and named themselves the Catholic Society of Delhi Township, Hamilton County, Ohio. Fr. John Martin Henni, from Holy Trinity, would make trips to rural areas, including Delhi, to say Mass. For eight years, they met at homes of the parishioners in order to celebrate the Sacrifice of the Mass. In 1842, Adam Emge donated 1/2 acre of land on Rapid Run (near present day Stonebridge) and the needed logs to finally build their church. The church was also used as a school; the people understood the importance of educating their children in the Catholic tradition. The first building of the church makes Our Lady of Victory the oldest parish in Hamilton County outside of the city. The parish was dedicated to St. Stephen for his perseverance in faith. Thrilled with their accomplishment, the parishioners still longed to make the church more accessible. The inconvenience of the log church’s location in the woods caused the parishioners, spurred on by their recent success victory, to begin looking for a new home. In 1852, Blaise Schwietzer and John Gierteisen donated land on Neeb Road. From March 18th to the 22nd, the parishioners migrated the wooden church, log by log, to its new home. 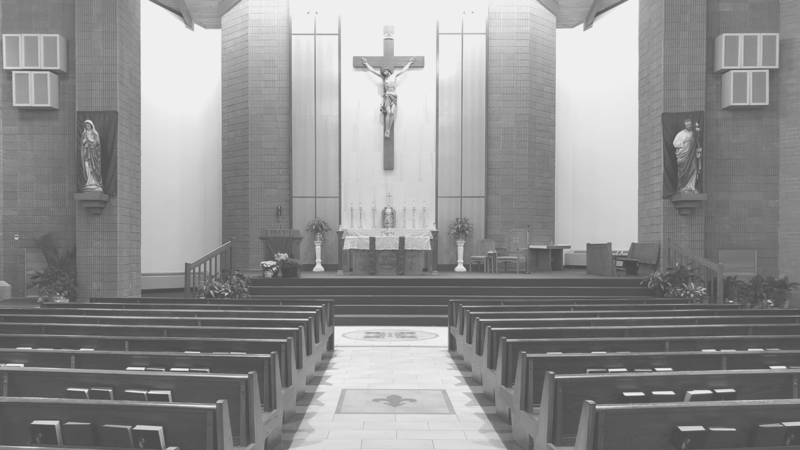 The church was ready for Mass on March 23, 1852, but soon, they ran out of space. On July 10, 1853, they laid the cornerstone for the first brick church, keeping the log building to serve as a school. Fr. Engelbert Stehle asked the church be dedicated to Our Lady of Victory because he had been ordained at the Our Lady of Victory Cathedral in Paris, France. Maria Zum Siege (Mary of Victory) was dedicated on December 4, 1853. The parish continued under the name of St. Stephen's, even though the church was called Maria Zum Siege, then Our Lady of Victories, and finally Our Lady of Victory. As the parish continued to grow, another brick church was built in 1908. As that church fell into disrepair, and the parish grew still larger, our current church was built in 1979. During the transition between the 1908 and 1979 church, mass was held in the East Wing, now the main office in the school. In 1842, OUR LADY OF VICTORY was established as St. Stephen, the 3rd Catholic Church in Hamilton County. The original church, of log construction, was located on Rapid Run Road, approximately 1/4 mile west of Neeb Road. In 1842, ten children attended the first school. Enrollment “swelled” to fourteen in 1844 and the first teacher contract was signed. In 1844, the Franciscan Fathers began serving the parish and continued until 1875. In 1852, the church was moved (literally, since the same logs were used) to three acres of donated land on Neeb Road. In 1853, a new church of brick construction was built and dedicated to Our Lady of Victories (later changed to Victory). The first permanent pastor was appointed in 1854. The old log church was used as the school until 1898 when a brick school until 1898 when a brick school building was erected. That building still stands as the back half of the present “old school”. In 1909, another new church was built and served the parish community until 1963. It was razed in 1977. In 1917, a Sisters’ residence was completed for the sisters of St. Francis of Oldenburg, who had been teaching and living in the school since 1899. In 1930, the front half of the “old school” building was completed. In 1960, the new school was completed. The east wing addition was completed in 1963 and the upper level served as the temporary church until the present church was completed in 1980. In 1962, a new convent was built and served in that capacity until 1989. In 1976, the gymnasium was built. It was renovated and expanded to double the capacity in 1989. In 1977, the church began demolition process to prepare for present building. Fr. Gruber oversaw the project. In 1990, the library was completed. In 1992, the gym was renovated to double its capacity. Members of the Athletic Association along with many other volunteers kept the cost of this project to a minimum due to endless hours of work. In 1993, the old school building was renovated with classrooms, library, science lab, and meeting rooms. In 1996, the old convent was remodeled and became the new Pastoral Center. In 2000, the new rectory was purchased. In 2001, the old rectory was demolished. Fr. Tom Meyer was assigned as our new pastor. The new school was renovated including the computer lab. In 2002, the convocation center was dedicated. In 2005, Our Lady of Victory begins the Why Catholic? Program. In October 2005, we honor the Blessed Mother by celebrating the Feast of Our Lady of Victory. In 2016-2017, we celebrated our 175th Anniversary as a parish. In August 2017, we dedicated the new grotto. 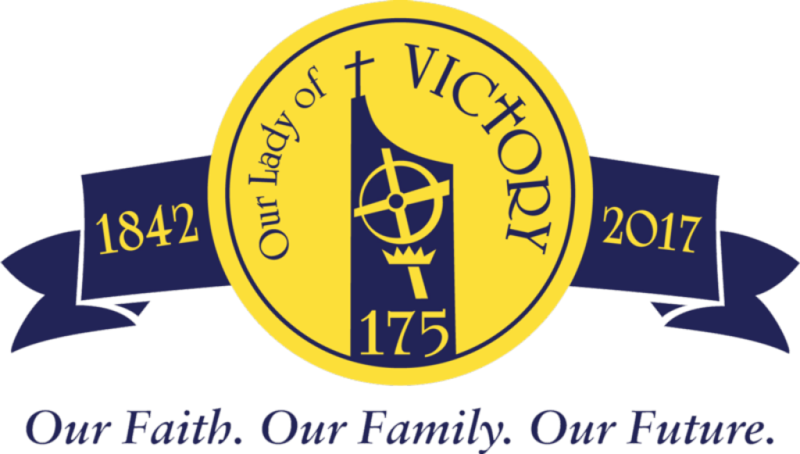 Our Lady of Victory celebrated its 175th year in 2016-2017 as a faithful Catholic community. We celebrated this milestone as only our close-knit parish family can do. and running through our 2017 Feast Day, we had events, gatherings, and socials.